The birds are beginning to sing for mates for their springtime songfest. The migrants are trickling back, and the residents are setting up their territories to find their women. Listening to the birds has a magical way of slowing our mind chatter down (Jon Young refers to this incessant chatter as Duct Tape man, because if we had some duct tape we could muffle it!). Of lifting our attentions out of the mundane densities of earth, and to these hearts on wings. The last bastions of abundant wildlife in our cities, suburbs, and even the rural places. Along with the flowers, they add a wider bandwidth of color and vibration that contribute to our expanse of livingness. And the sounds, they guide the eyes to their sometimes illusive perching and moving about. I love this time of year. I know I will hear a new bird almost every day at this time of year. Yesterday, I heard a lone pine siskin (an ascending buzzy “Szhreeeee” at the tops of the trees, especially the conifers). In the winter they fly around in flocks at the upper levels of the canopy. I think I also heard a single huttons vireo, a single plaintive extended note that is piercing and insistent. The male chickadees have gone from their “chick a dee dee dee” to their “cheese burger” song, which indicates they are setting up their territories. The spotted towees are trilling, as are the dark eyed juncos. I was surprised to hear the red-wing black birds last month (“poke your neighborrrrrrrrrr”). The brown creepers are also singing (“sweet sweet little more sweet”) along with their ecological ally, the red breast nut hatch’s tinny horn, repeated over and over again a little like a car alarm (“ank ank ank”). It is wonderful ly helpful to learn these “handles”—these ways of describing and remembering bird songs and calls. I learned them from Peterson’s Western Birding by Ear tapes. It is a system for creating handles and noticing how to listen to and describe sound. I will be doing a workshop in which we will be spending time listening and creating handles, as well as watching and noticing how our state of consciousness affects and reflects bird language. June 9-10 at Hidden Lake. Click here for more information. 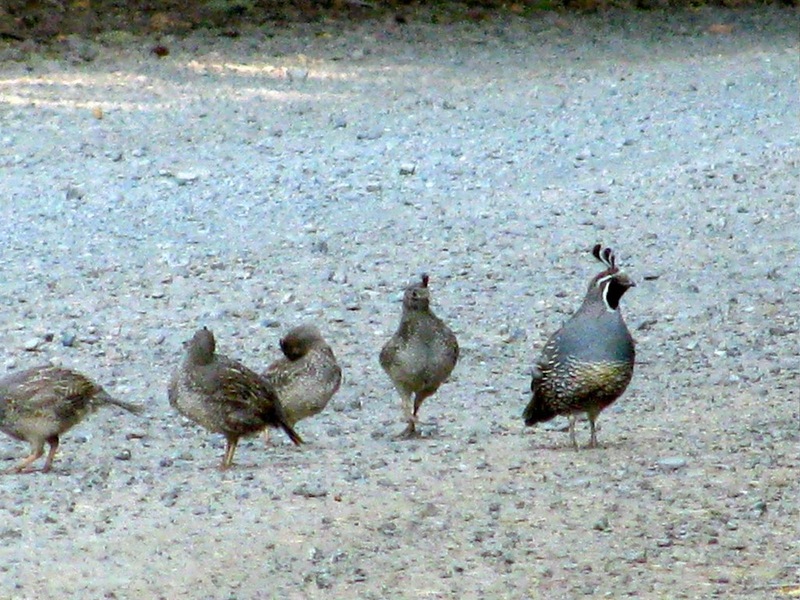 Thanks to Gaye Chapman for her photographing our resident California Quail, who are “chi-ca-go” ing all around the upper west edge of the land.